Chalets Direct Interactive Goes Live! Chalets Direct has now launched our Interactive area where users can get sociable! We have always encouraged user interaction - we created the Solutions Room in autumn 1999, and since then have added more and more areas where visitors can talk to each other, such as the Ski & Board Jobs forum and the Resort Reviews section. So now we have decided to group all these features under one heading to make it easier for visitors to get around. Our latest addition, The Ski Blog, is also part of this area. Well the Solutions Room is a unique bulletin board where people looking for holiday accommodation can post up what they're looking for. Chalets Direct members can then reply to them to either match their requirements or propose alternatives. As I write,our developers are working on further enhancements of the Solutions Room which will make it more efficient for both types of users - so watch this space. The Resort News & Reviews section is for you to post up reviews of your favourite resorts. If you had a great time there let everyone know about it and tell us why it was so good. You can post reviews in various categories, including the resort, the ski area and summer holidays. You can also post about the weather and snow conditions, which was used extensively last winter, when snow depths were exceptional. Reviewers can also put up a photo to go with their post, so we had a great gallery of snow pictures stretching from Colorado to Bansko! Other features in the interactive area are the Ski & Board Jobs message board and the Long Stay Q&A, so if you're looking to spend more than a week or two in the mountains these could be interesting for you. For jobseekers take a look at the positions on offer, or post up what you've got to offer an employer. And for the Long Stay Q&A, if you're looking for accommodation or need some help you may well find an answer here. And of course there is the Ski Blog - which we hope will provide interesting information and give you a chance to give us your feedback. So as autumn arrives, Chalets Direct is looking forward to another great winter season! If you're tempted to go on a wintersports holiday - and you've never tried any of the sports before - then there are a few things to bear in mind. Similarly if you're an experienced skier and are hoping to take beginners with you the next time you visit the mountains, there could be a number of issues to consider which could either make or break the holiday. A failed ski holiday - where the beginners in the party hate every minute and just don't get the whole skiing/snowboarding thing - can result in simmering resentment at best, divorce/relationship breakdown at worst! So how do you make sure that a wintersports novice loves their first week and is desperate to come back for more? Just what makes a great Beginners' Week? Preparation is key. If you are new to skiing and snowboarding then doing your homework can make your first steps a lot easier. 1. Physical preparation: If you spend 50 weeks a year behind a desk at sea level, your body is going to get a big shock when it is suddenly required to be physical at altitude. Yep it's obvious but true - working on your physical fitness is definitely going to help you get more out of your ski holiday. Unfortunately beginner skiers and snowboarders probably expend more energy than intermediates - the whole effort of standing up after a fall can be exhausting. So if you do lead a fairly sedentary lifestyle take a look at increasing your exercise levels from around six weeks before you go. Both aerobic and anaerobic fitness are required for skiing and snowboarding. You don't need to be able to run marathons but feeling confident that your body is not going to seize up with the slightest effort is going to be beneficial. Plus you will feel better for it! For some great tips on getting fit for skiing see Graham Bell's excellent features on the BBC website. 2. Pre-Holiday Lessons: If you are not too far away from an artificial ski slope or an indoor snowdome then it's definitely worth investing in a few lessons before you go. The whole business of putting on strange boots and then clipping them onto a plank, or two, is very unfamiliar. A few sessions at your local ski centre before your holiday will help you conquer this weirdness. Having a chance to move around with them and take a few pratice turns down a slope will help enormously when you get onto the snow for real. Getting used to the equipment before you get there will help to relieve the stress of the first few days. The rate of improvement between beginners who've had pre-holiday lessons and those who haven't can be remarkable - quite often these are the ones who will shine when they get onto the snow. 3. Ski and Snowboard School: Just as lessons before you go will prepare you, the only way to learn properly when you're there is to take lessons - from a qualified professional. Don't be tempted when one of your party who has been a couple of times before, says that he/she will show you the ropes - you run the risk of ruining your holiday and theirs'. Ski schools, especially French ski schools, have had bad press it has to be said. We're all aware of the archetypal French "follow me" ski instructor who has to be coaxed and flattered to impart his wisdom. Fortunately this is changing. 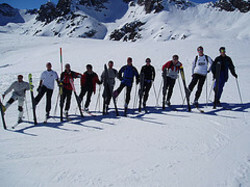 Many ski schools now offer small group sizes and English speaking instructors. Maybe have a look at the resort website before you go and see how many ski schools are operating there - several ski schools in one resort will generally mean that there will be competition between them, so they have to be more proactive and customer focused. It's also worth finding out what other options are available for beginners. Ski and snowboard school usually comprises 2-3h hour sessions at the same time each day over 4, 5 or 6 days. But there maybe more specialist or more tailored options. If you are group of beginners for example - maybe 4 or 5 of you all at the same level - it could be more fun to book private sessions for your group. Whether you choose to ski or snowboard, look on lessons as an investment rather than an expense. As with all investments it's worth investigating and researching. Look at the school's website, email for information, even call them if you need. And make sure you book in advance so that you don't get disappointed when you arrive. A word of warning though - as ski schools are usually seasonal businesses their offices may not be manned year round. So if you call in July and don't get an answer, emailing might be best. 4. Choosing a resort: This is a tricky one, especially if you are a beginner and you are organising the holiday. How on earth would you know what makes a good beginners resort? Most ski resorts will have beginners facilities - ie gentle nursery slopes with gentle lifts so that beginners can practice their first turns without fear. So what should a beginner look for in particular? In reality, all ski resorts want to attract skiers and boarders from beginner to expert, so they will make sure that there are green slopes (the easiest and gentlest), right through to black ones (the steepest), with usually a preponderance of blues and reds in between. The answer to what resort you should choose depends on what else you want out of your holiday. Let's not forget that a ski/snowboard holiday is a whole package, the apres-ski can be as important as the skiing itself! So make sure that you and your group know what you all want. If you're looking for chocolate box chalets and horse-drawn sleighs then a purpose-built resort will not fit the bill. If you want lively bars and rocking clubs, make sure there is enough nightlife in your resort. If you want to be able to ski from the door then it's likely that a high altitude resort will be the best bet. If you want good shopping and plenty of other things to do then look at going to a large resort where there will be more facilities. If you're still at a loss then ask someone else! Other skiers and boarders will always be happy to share their experience. Good online message boards where you can ask questions are the Snowheads Forums and of course our very own Solutions Room. Skiing and snowboarding holidays are fun and rewarding experiences, so a little planning and preparation will go a long way! British Olympic medals are very much in the news at the moment. Who'd have thought that as I write Team GB is sitting third in the medal table! It's great that Britain is achieving worldwide sporting success, to the extent that even the Aussies are whinging. As a nation, we've always been pretty hard on our sportsmen. Tim Henman's failure to win Wimbledon was a disappointment to us, despite the fact that he was in the world's top ten for 10 years, and for much of those ten years tennis was dominated by two of the greatest players in history - Pete Sampras and Roger Federer. Alain Baxter finished third in the Slalom in the Salt Lake City games of 2002, and was awarded the bronze medal. A few days later he was stripped of the medal and banned for 3 months when it was found he had tested positive for a banned substance, lev-methamphetamine. Retracing his footsteps, Alain found that the substance had come from a Vicks inhaler he had purchased from a local pharmacy. Alain protested his innocence, on appeal the suspension was lifted, and it was recognised that he had inadvertently "taken" the drug. However the bronze medal was not returned. Since then Alain has worked hard to regain his status. Superstars, the popular TV series, has brought him back into the public eye. In 2004 he was the series champion and demonstrated just what an all round athete he is - beating his opponents in diverse disciplines. He is an athlete we should be proud of, and it's about time we recognised his skill and talent. Now Alain is preparing for the 2010 Winter Olympics in Vancouver. In a bid to win sponsorship Alain has produced his own fund-raising calendar where you can certainly admire his "athleticism". We did ask for a sneak preview but unfortunately for us his press office can't release the photos until the calendar is released - so sorry girls, but he did make Page 3 in The Scottish Sun! You can follow Alain's story on his website. We would like to wish him all the best and look forward to seeing him on the podium in 2010. Reviewers required - we need you! The Chalets Direct Resort News & Reviews section opened last autumn. We wanted your opinions on your favourite ski areas, and to let you see what was being said by others about resorts you may not yet have tried. Another reason we added this area was to allow people in the resort to tell us exactly what the ski conditions were like. Winter 2006/7 had not been a great snow year - yet in many resorts good skiing could still be found, so we wanted people to be able to tell us when and where they'd had a great ski and enjoyed good snow. Over last winter we had tons of reviewers telling us about snow conditions - reports on the latest snowfalls, with pictures and in some cases links to YouTube videos - so we knew that things were good. So as summer turns into late summer and then early autumn, and you're starting to think about where to ski and snowboard this winter, we want our Reviews section to give you some ideas. If you've been skiing somewhere memorable tell us all about it. This is your chance to wax lyrical about the resorts you love. Let us know the ins and outs and your top tips. We need your input! You can post a review on a resort or on a ski area - just click the Add Review button and off you go. We know that there are a lot of experienced skiers and snowboarders out there, with lots of helpful advice for others, so why not join in!